Little Mrs. Sommers one day found herself the unexpected possessor of fifteen dollars. It seemed to her a very large amount of money, and the way in which it stuffed and bulged her worn old porte-monnaie gave her a feeling of importance such as she had not enjoyed for years. Mrs. Sommers is practical. There are a few references to her having greater wealth before her marriage, but now she contemplates on the fifteen dollars with a ruthlessness that would do a miser proud. Over the next couple of days she determines, down to the nearest penny, what she will buy. Cloth with which to make shirt waists for the children. A couple of dollars to supplement shoes to make them last longer. All fundamentally sensible. When all is meticulously planned she takes the cable car to a department store and waits in line. But it’s a very long line (there’s no evidence to support this, but I like to think it’s not long before Christmas), and she gradually shuffles past the tables of enticing wares. An all-gone limp feeling had come over her and she rested her hand aimlessly upon the counter. She wore no gloves. By degrees she grew aware that her hand had encountered something very soothing, very pleasant to touch. She looked down to see that her hand lay upon a pile of silk stockings. A placard near by announced that they had been reduced in price from two dollars and fifty cents to one dollar and ninety-eight cents; and a young girl who stood behind the counter asked her if she wished to examine their line of silk hosiery. She smiled, just as if she had been asked to inspect a tiara of diamonds with the ultimate view of purchasing it. When she gives in and buys the stockings, you might expect the story to go down a darker route, to end with what happens when she returns to her family without the clothes she planned to get. But that’s not the tone at all. What happens when she returns home takes place beyond the end of the story, and the prose doesn’t speculate what might happen. The focus stays in the moment. 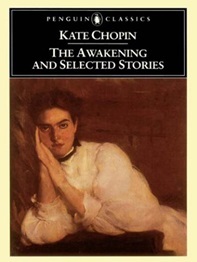 The story therefore becomes a cheerful little tale about a woman taking a momentary taste of luxury; and because the value is so small (it is only fifteen dollars) the reader can more easily feel a vicarious joy from the piece. Zimmet, will prepare a personalized treatment plan for your particular condition. now you can go for the Jobst compression stockings instead of your regular socks because they can also improve your health while wearing them. Anyway, discuss this concept together with your physician first. I haven’t deleted this spam comment because its appearance here amuses me.